New research conducted by legal AI-led litigation research system Casetext, has shown that 83% of US judges and their clerks find that lawyers’ briefs are missing relevant cases that could impact the trial ‘at least some of the time’. The survey, of over 100 US Federal and state judges, revealed what the company says are ‘some pretty shocking statistics’. 100% of the judges surveyed, i.e. all of them, said that attorneys missing relevant cases is a problem. 83% of the judges said that they or their clerks catch missing relevant cases at least some of the time. 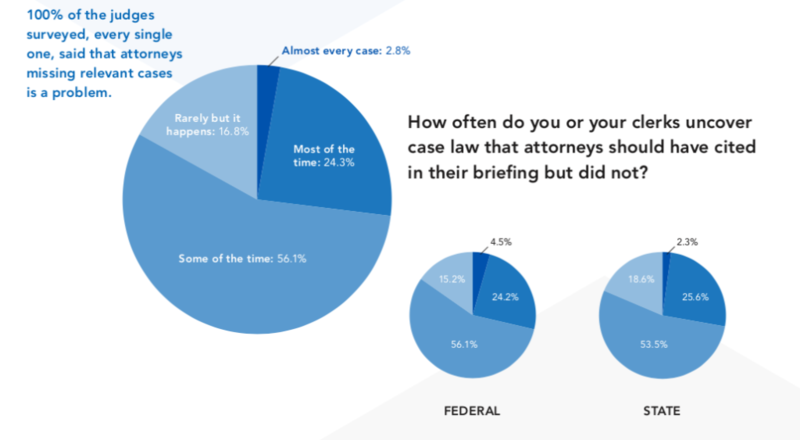 While only a small minority (16%) said that they rarely, but still sometimes, catch missing cases that litigators should have cited in their submissions. Jake Heller, CEO and founder of Casetext and its CARA analysis system, added that AI-based tools ‘are helping mitigate this risk’. Understandably, a company providing an AI solution to this problem would wish to point that out, but it would appear they are right to do so, given the scale of missing relevant cases. Artificial Lawyer asked Heller some more to dig deeper into these results. – Did you find the results surprising? I did find the results surprising. I knew that this was a problem based on my and my colleagues’ time clerking for judges on the federal court, we saw firsthand how often even great litigators from top firms missed important information, likely because they were pressed for time or working with limited technology or both. But I had no idea how extensive the problem was, or how widespread the issue was. Not a single judge in our survey felt that litigators don’t miss precedents, it was just a matter of degree. – What sort of cases were they missing? Was there a pattern there? We didn’t hear a pattern of a type of case from the judges. Based on my experience, it was likely the type of cases that are both the most important but also the easiest to miss, precedents that are directly on point (the same fact pattern, legal issues, jurisdiction, and procedural posture) but that use slightly different words than those that you searched for. We built CARA in large part to overcome the inherit limitations of keyword searching and enable lawyers to find conceptually related cases, even if they don’t use the exact keywords you might use. – What happened when a judge found cases were missing? How did they address that? They usually must do the research themselves, sometimes leaving that task to their clerks. For two-thirds of the judges we talked to, they said it had a material impact in their chambers, usually because a party was relying on a theory that was undermined by the precedent they missed. Two-thirds of the judges surveyed reported that lawyers who relied on the wrong precedents ended up losing a motion or an entire matter before their court, so there were real and serious consequences. A few judges also noted in their commentary that, even when the attorney doesn’t lose the case, they lose credibility with the court and their clients when the judge or their clerks discover the cases the lawyer should have brought before them, often to their surprise.